You probably won’t see most of these foods at a Swedish restaurant or in a cookbook, but it’s food like this that make many a Swede excited to travel home just to get a taste of it. Although not as bizarre as eating toasted crickets in China, live octopus in Korea or boiled eggs with baby chicks in them in the Philippines (ahhh, balut!! ), some of these are just plain weird. I have had the privilege of eating a few of these foods myself, and let’s just say that I probably will not be seeking the recipes and have crossed it off my bucket list of things to eat in my life. This is a truly native Hälsingland dish that makes me wonder how it all began. Did the baker accidentally drop a vat of pig’s blood in the bowl for making crisp bread? The “palt” is similar to a cracker made with rye and pig’s blood. 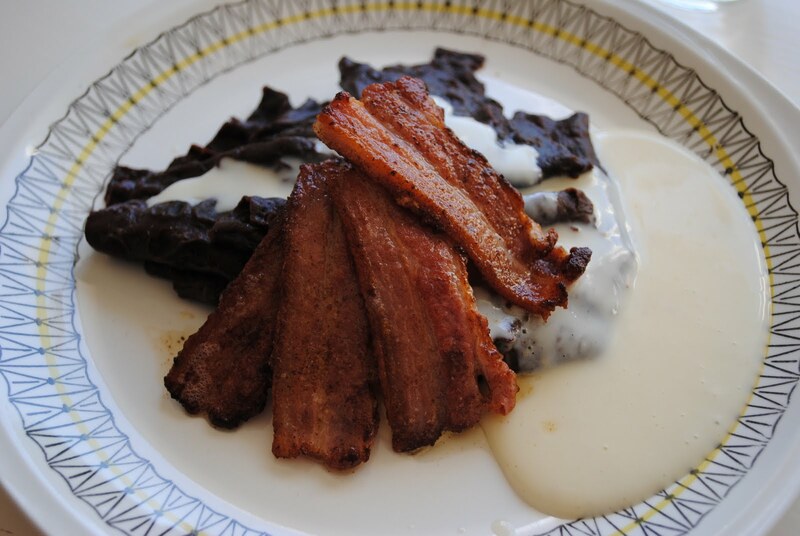 This is boiled in milk and served as a side dish with fried bacon and accompanied by a sweet and sour lingonberry jam. It has a quite rustic flavor that I cannot compare to anything remotely similar in North America. 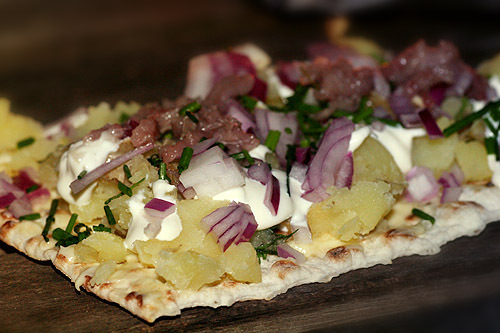 But if you want to walk, talk and eat like a true country Swede, this is the dish to try! 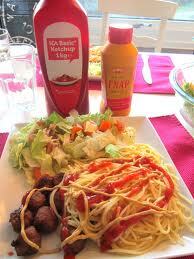 Swedes have a strange love affair with ketchup. When I first met my Swede, he was a poor student living on a fixed income. This would be his daily sustenance. I don’t know if my husband was just too lazy to make pasta sauce, but he would squirt it on his meat sauce anyway totally ruining my lovely Italian meal!!! Sacrilege! Every American I know who lives in Sweden all agree that their love of licorice flavor is probably a result of a defect on the Swedes’ taste buds. 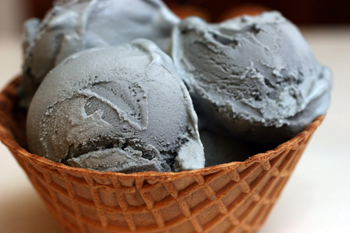 It is pretty nasty in my opinion, and they love it with ice cream. 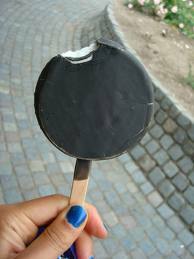 Swedes love licorice in their chocolate, candy and probably potato chips if they could help it. It has that pungent, tar-like yet sweet taste that I just can’t acquire. 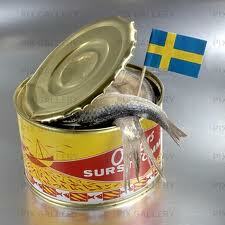 In August, it’s surströmming season, and there are people yearning for this stuff. 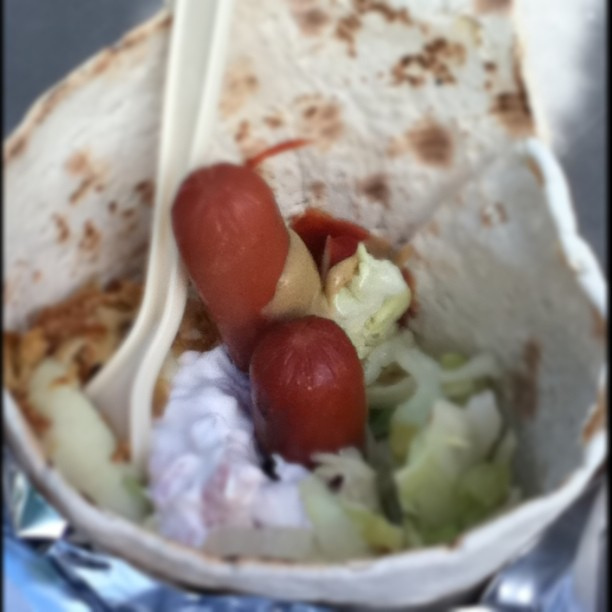 It is a Swedish wrap of fermented fish, potatoes, sour cream and onions that really tests your faith of Swedish cuisine. Let us just say that eating surströmming is a near pornographic experience since it has the aroma of rotting fish. Need I say more? Swedes wash it down with a whole lot of snaps, beer and good cheer. Bring a sense of humor when eating it, and it will make the experience a whole lot easier. 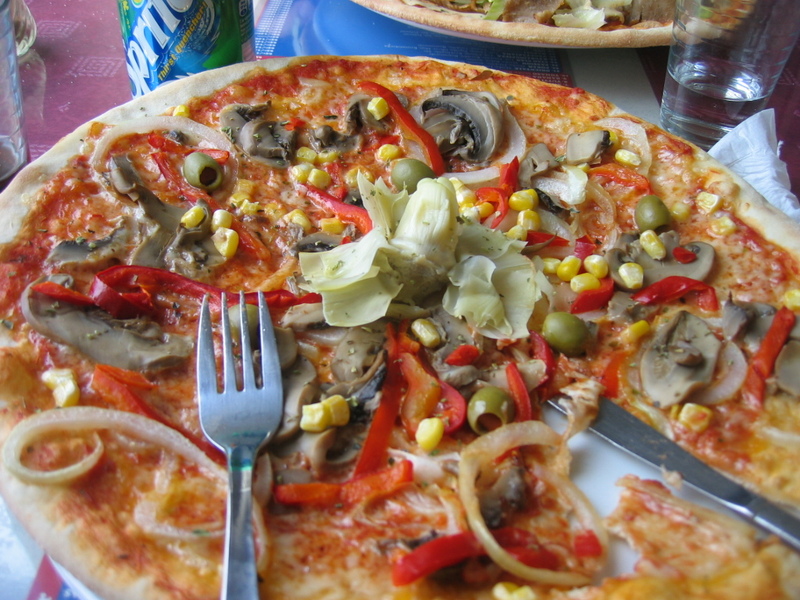 Swedish pizza is a whole other animal compared to U.S. or Canadian pizzas. Since 99.9% of the pizza joints are owned by Middle Easterners, there is that special Middle Eastern flair to all of the pizzas. It must be in the crust which tastes strangely like pita bread. 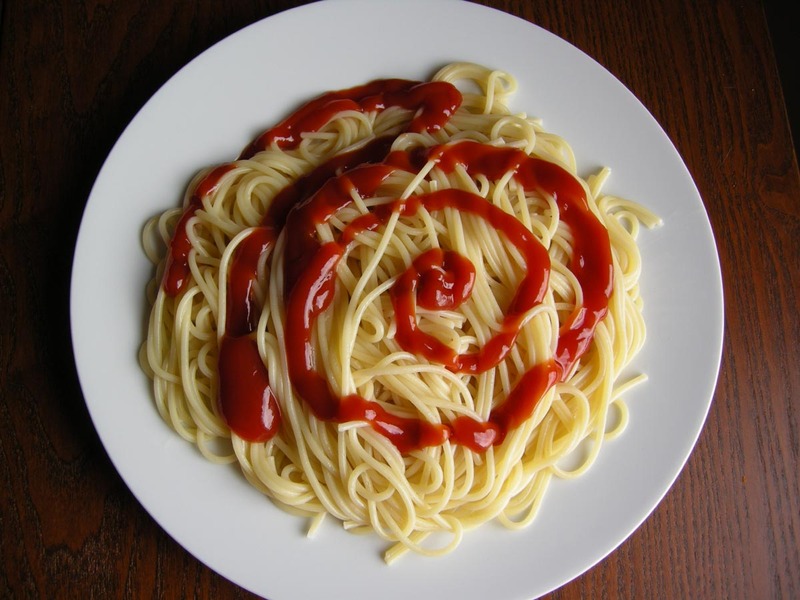 This is the cheapest food to get outside the Swedish home other than the ubiquitous hamburger or hotdog. You can order a pizza with bernaise sauce or even kebab meat (which of course, we refer to as gyros meat, not shish-kebab meat like you would think). 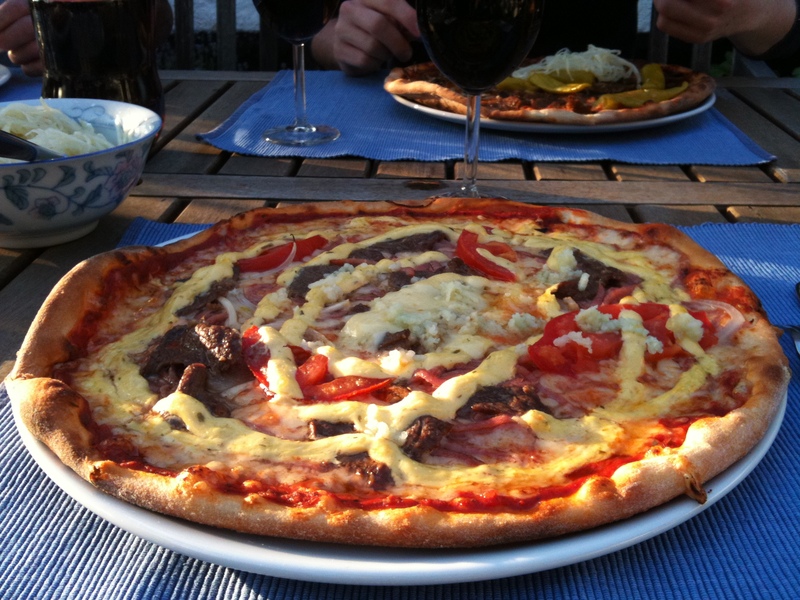 Also, Swedes order an ENTIRE pizza for themselves and don’t slice them up in triangles to share with others. I dare you to find any of these items outside Sweden! If you do, please comment and I’ll make sure to fly there and try it. ← Happy Fat Tuesday! Fettisdagen är här!!! Fermented herring? I have learned something new. Thank you. How the hell they eat palt in the south I have no idea, but in the north we have two commons sorts, one filled with blood, and one without, but both our sorts are rolled into a small ball and filled with pork and then boiled. We don’t have bacon and this is our maincourse. But it’s mandatory to serve it with lingonberry jam and milk. There’s a place here in Portland, OR called Broder that has Tunnbrodsrulle on the menu…I’m allergic to shellfish so I haven’t tried it, but it sounds pretty good to me. So there you go…if you’re ever in Portland, you can get Tunnbrodsrulle.